Simon & Schuster, 9781451692297, 384pp. First invented in 1947, hydraulic fracturing, or fracking, has not only become a major source of energy, it is changing the way we use energy, and the energy we use. It is both a threat and a godsend for the environment, and it is leading the revival of manufacturing in the United States. A definitive narrative history, The Boom follows the twists and turns in the development and adoption of this radical technology. It is a thrilling journey filled with colorful characters: the green-minded Texas oilman who created the first modern frack; a bare-knuckled Oklahoman natural gas empire-builder who gave the world an enormous new supply of energy and was brought down by his own success and excesses; an environmental leader whose embrace of fracking brought an end to his public career; and an aging fracking pioneer who is now trying to save the industry from itself. A fascinating and exciting exploration of one of the most controversial and promising sources of energy, The Boom “brings new clarity to a subject awash in hype from all sides…a thoughtful, well-written, and carefully researched book that provides the best overview yet of the pros and cons of fracking. Gold quietly leads both supporters and critics of drilling to consider other views” (Associated Press). "Russell Gold’s The Boom is a double quest. He tells the story of the biggest innovation in energy so far in this century—the shale gas revolution. He captures the personalities, and the drama and surprises, and brings clarity to the debate about the environmental impact—and what it means for the U.S. economy and “energy independence.” But it’s also a more personal story – about “The Farm” in rural Pennsylvania where he spent time as a child, and his quest to understand what is happening in this new age of shale gas." "Gold's book is an early must-read for 2014: it is both a thorough and fascinating examination of the fracking economy and the technological innovations that have made these new riches accessible (including the often catastrophic damage done in the process of obtaining them)." "An insider’s guide to the most controversial energy-production technique in the United States." 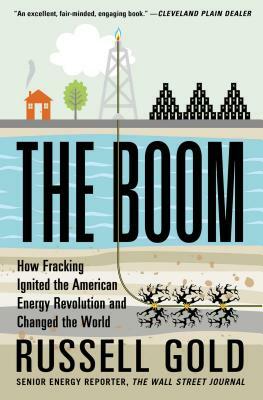 "Russell Gold's The Boom, authoritative and fairly balanced, is a welcome guide - the best all-around book yet on fracking."